This set represents one of the more recent additions to Tamiya’s expanding line of 1/16th figures and adds to a lineup that is currently dominated by German WW II subject matter. However, this set does complement rather well one of Tamiya’s earlier installment of the same genre, 36305 Feldmarschall Rommel. Tamiya has elected to place this figure as a Tank crewman although as one examines this set, the attire allows the figure to pass off as any member of Deutsches Afrika Korps many armored recon or mechanized troops as well. Indeed a fair amount of leeway was given as to the attire in the desert with availability (due to constant logistical shortages) and comfort being the main criteria rather than dress regulations. So without further ado let’s have a look inside. Tamiya’s boxart has always been attractive and this figure packed in Tamiya’s staple 1-piece box characteristic of all its 1/16th figures is no exception. As always assembly & painting instructions are adequately provided at the back together with a brief history of figure while the color scheme for the various personal equipment and optional items are located at the sides of the box. Inside are 3 sprue trees and a set of decals and unlike previous figures this one comes with a fair bit of diorama accessories. Located on the main sprue are the various parts of the figure as can be seen in photos. This set offers 2 poses by giving an option on the position of the arms. The figure can be posed in the process of drinking from a half opened water bottle or playing with a pet chameleon. The facial features appear to be adequate although it unfortunately does not resemble the well drawn figure on the boxart and at certain angles appears slightly on the comical side. Molding was adequate although some manageable seam lines were visible. The figure itself appears to be decked out in the 5-button, cotton twill, tropical field blouse (early version) that was fashioned after the standard M40 field gray field blouse. Accompanying the field blouse is the standard breeches for unmounted personnel in tropical colors. He’s shorn in the knee length version of the tropical boots which had an ankle length version as well (not provided by the kit). The greater use of canvas over leather in the boot and in much of the webbing of DAK personnel meant that their equipment lasted longer in the unforgiving, harsh sunlight. His attire is topped off with a M41 tropical field cap and the all-important set of goggles, a must have for the desert. Tamiya was nice enough to give 2 sets of clear plastic goggles in their clear sprue tree. The other is for the pith or safari helmet which is one of the nice features of this set. Issued first to those operating largely in the Mediterranean it was also apparently issued by troops as far as Southern Russia. 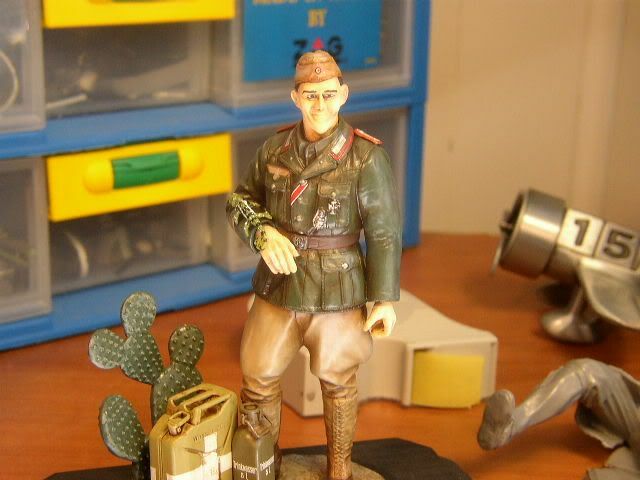 The pith helmet provided could be used as a diorama accessory should the M41 cap be used on the figure. A fairly detailed sidecap is also included as an additional option. As mentioned earlier the figure need not be merely a Tank crewman and could pass off as quite a number of services in the DAK. In most cases apart from the breeches, the uniforms of the various DAK branches differed largely in only the waffenfarbe or branch/service color, which they wore on their shoulder boards and collar tabs. For example, pink was used for armored units in general while lemon yellow was used for armored signal corps and the artillery wore red waffenfarbe. The next few photos of the rest of sprues show the generous inclusion of various accessories that can be used in a small vignette. The accessories include a 5-litre water container, a jerry can, a cactus plant, a most unusual but very welcome chameleon and a simple base to place everything on. According to the description on the box, chameleons were quite often kept as pets. The cactus was not as well detailed and having a desert scrub instead would have been more appropriate as the latter was more commonly found than the variety of cactus being featured. An addition of a weapon like a MP40, although not necessary would have made the accessories complete. A simple decal sheet is provided with the Afrika Korps cuff band, ranks and shoulder boards, badges and medal ribbon. Overall it is a nice set and more so for modelers who are fans of anything DAK. 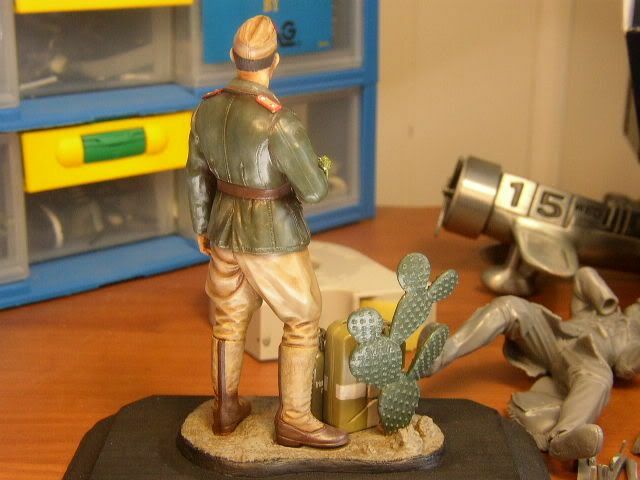 The addition of diorama accessories such as the chameleon, water containers and of course the cactus are really nice touches and a big plus which make this otherwise somewhat plain figure more presentable. The provision of a pith hat closely associated with tropical theaters especially North Africa adds to the theme as well. I hope the provision of diorama accessories will be the trend for future Tamiya 1/16th figures as it would add a whole new value to their figure kits. On the negative side for me would be the facial features. Although sets like Rommel were well sculpted the same cannot be said for this set and some of Tamiya’s other 1/16 figures. While the features were not necessarily soft the expression could have been made less comical. However, this is a minor shortcoming in what is a decently detailed set with lots of extras. The Deutsches Afrika Korps or DAK was essentially an expeditionary force sent to assist the Italian forces in North Africa in early 1941. Formed around the 5th Panzer Regiment and several smaller units on February 19th, 1941 it was later fortified with the 15th and 21st Panzer Division. However, the DAK was not comprised of only German forces but included Italian forces as well. Furthermore, not all German units serving in North Africa were Afrika Korps. With their famous leader, Erwin Rommel; the DAK together with their counterparts, the 8th Army and Montgomery, became forever immortalized in the annals of WWII for their see saw battles over an unforgiving environment. Although the DAK were outnumbered in all departments, it was quality of their tanks, planes and equipment rather than numbers that gave them the ability to take on but never take over the Allied forces. The DAK eventually surrendered on May, 1943. The battle for North Africa was eventually determined not only by numerical superiority when the Allies finally managed to have sufficient numbers to negate the German superior arsenal but arguably by logistics as well. This is a nice set for modelers who are fans of anything DAK. 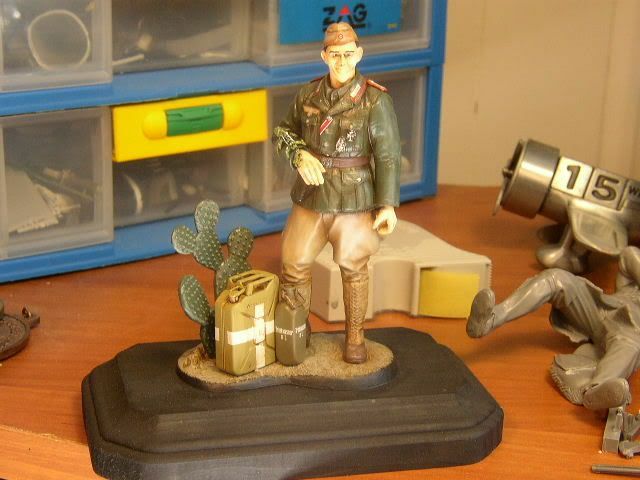 Diorama accessories included in the kit such as the chameleon, water containers and of course the cactus are really nice touches and a big plus which make this otherwise somewhat plain figure more presentable. Copyright ©2019 text by CK Tang [ BEACHBUM ]. Images also by copyright holder unless otherwise noted. Opinions expressed are those of the author(s) and not necessarily those of Historicus Forma or Silver Star Enterprises. All rights reserved. Thanks for that review, CK, and Rudi, for the additional comments. Most useful. This, and the Japanese pilot, are the only two Tamiya 1/16 figs I've so far given a miss. None of the reviews so far have been glowing,(unlike the ones on their other figs), and the face does seem disappointing in comparison to earlier figs. I also can't understand why they left out accessories like the MP40 and the potato masher grenade which they include with EVERY other German kit. On the other hand, a Kar'98 rifle might've been a nice change. However three choices in headwear makes it interesting. CK & Rudi, how would you guys compare this chap against say the Tamiya 'German Infantryman on Manouver', or the 'German Elite Infantryman'? I've done this fella. I looked up the chamelion by Googleing "North African Chamelion" and this guys picture came up. The figure itself was easy to assemble, but his proportions seem off. He looks like a fat 13-year old to me. :-) :-) :-) The ground base and accessories were nice, and I really liked the decals for the ribbons, insignia, etc, but why go to the trouble of decasl if your not going to make them for the white stripes of the water jerry can??? I had to mask and paint that, a real pain. Sorry for the late reply Gentlemen as I was away. Thanks for the additional and important details Rudi. The boot info came off a link (http://www.germanmilitaria.com/Heer/photos/H031156.html) which featured the knee length version and mentions the ankle version as tropical versions, probably because of the canvas material used for the uppers. Sorry about not verifying that bit of info elsewhere guys. Yup David, the lack of some weapon for weapon nuts like myself was a bit of a letdown. Unfortunately I didn't get the 2 kits you mentioned yet so I can't really say how this kit will measure up but I do like the Elite infantryman's pose. Thanks Engin & Rudi for putting this up.